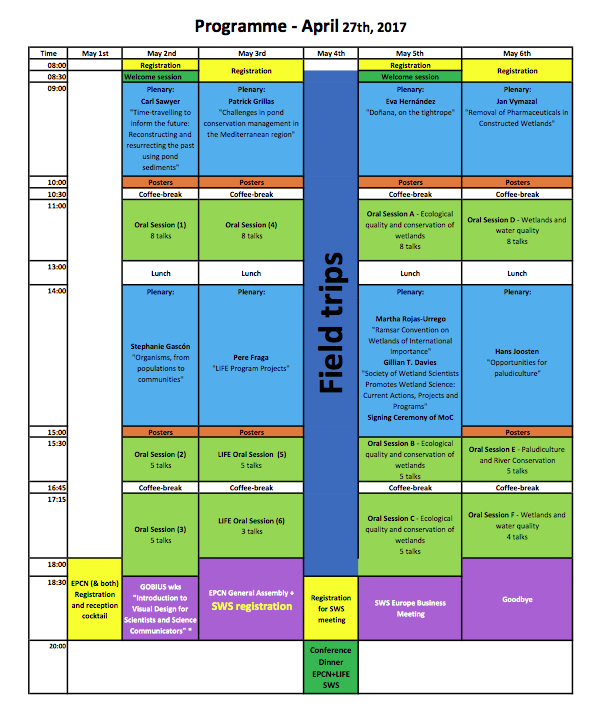 The most updated version of the meeting programme is available for download HERE; also available is a NEW detailed programme & meetings infos HERE (version from May 1st). The workshop "Introduction to Visual Design for Scientists and Science Communicators" will be given by João T. Tavares, a biologist, illustrator and graphic designer, one of the co-founders of GOBIUS Communication and Science, the special sponsor for this meeting. The BOOK OF ABSTRACTS can be downloaded HERE (version from May 1st). One-day, post-conference excursion to Doñana National Park (optional), is organized by SWS. If you want to go on this field trip, please book your return flight and your hotel checkout on Monday, May 8, 2017. Carl Sayer - "Time-travelling to inform the future: Reconstructing and resurrecting the past using pond sediments"
Pere Fraga - "LIFE Program Projects"
Stéphanie Gascón - "Organisms, from populations to communities"
Patrick Grillas - "Challenges in pond conservation management in the Mediterranean region"
Detailed information for 12th Annual SWS European Chapter Meeting can be found in its webpage. Keep in mind that he first author of any kind of communication must be registered as participant in the Conference. Poster size A0: 841 x 1189 mm. Detailed instructions for all communications will be release soon. The best oral and poster presentations given by students will be awarded. The student should be the presenting author of the oral/poster presentation in the congress. All the contributors of the 7th EPCN Workshop + LIFE Charcos Seminar meeting are invited to submit their works in the international journal Limnetica, published by the Iberian Society of Limnology (AIL). The journal publishes original papers on ecology of continental waters. Its scope includes ecology of rivers, lakes, reservoirs, lagoons and wetlands, biogeochemistry, paleolimnology, development of new methodology, taxonomy, biogeography and all aspects of theoretical and applied continental aquatic ecology. The journal publishes two volumes each year, and a selection of papers from the 7th EPCN Workshop + LIFE Charcos Seminar meeting could be included in one of the issues. Limnetica is indexed in: Web of Science ® ISI – Thomson, Scopus, BIOSIS Previews®, Aquatic Sciences and Fisheries Abstracts (ASFA); Zoological Record ®; Freshwater Biological Association (FBA); NISSC’s FISHLIT database; between others. The submission deadline will be announced by the end of the 7th EPCN workshop + LIFE Charcos Seminar. Visit Limnetica for more information about the journal and instructions for authors.